An affordable weight indicator with full keypad and smart features, the GK offers a simple user interface for quick operation. The GK housing is constructed of ABS plastic, while a backlit LCD features large digits and capacity tracker. GK comes with a wall bracket for easy, secure mounting. 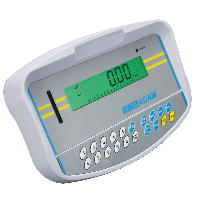 Connect the GK to any Adam platform scale to perform numerous applications, including weighing, percentage weighing, checkweighing, parts counting and animal/dynamic weighing. For more information on the GK weighing indicator, please contact us.